All the men have been identified, thanks to Catherine Alleyne and jakmac. L-R: Pat McKenna, James Dunn, Joe McKenna, Andrew Hartley, Wullie McMachon and Edward Doyle. This page was added by John Mc Farlane on 07/02/2013. 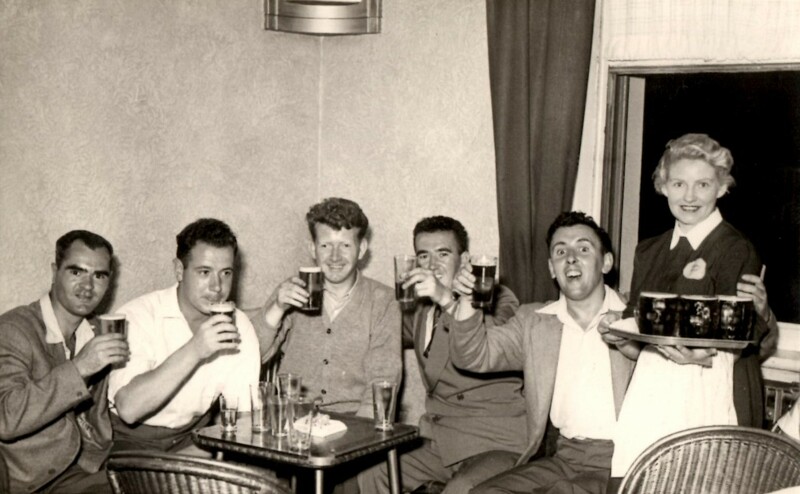 I think first on the left is Pat McKenna, the next is definately James Dunn, the other three I am not sure. Blackpool at the Fair was the place to be as was the September weekend, great place for fun and entertainment not to mention a wee drink or two! Hi Kit your first name is right the rest are Joe McKenna, Andrew Hartly, Wulle McMachon and Edward Doyle.